Today’s guest blogger is longtime friend and insect collecting partner Rich Thoma. Rich and I first met nearly 30 years ago and have been collecting insects together ever since. Rich is a strong advocate for educating children about natural history and has developed some rather fun methods for doing this. His unique sense of humor in doing this is on display in this post. While Ted’s away, he asked me to fill in for him with an article for Beetles in the Bush. I thought I would take this opportunity to introduce you to some unique beetle species found in my collection. All were caught long ago when I first started collecting insects. Here they are for your enjoyment! The Colorado Mr. Potatoe Head Beetle was first discovered by Dan Quayle, ex vice president of the United States cleaning his son’s toy box when the family moved from the vice presidential mansion. Most entomologists feel this beetle is a subspecies of the very common potato pest, the Colorado Potato beetle. It has been speculated that a shipment of Mr. Potato Head toys was somehow mixed with a shipment of GMO modified sweet California Russet Potato’s. The beetles needing a new food source found the hollow, interior of the Mr. Potato head toy to their liking. 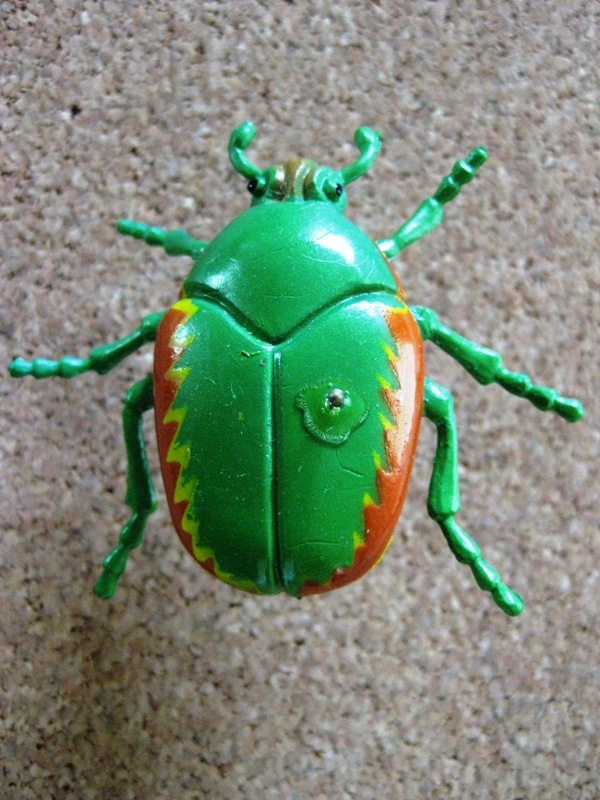 Inedible plastics from the toy have been incorporated into the exoskeleton of the beetle. 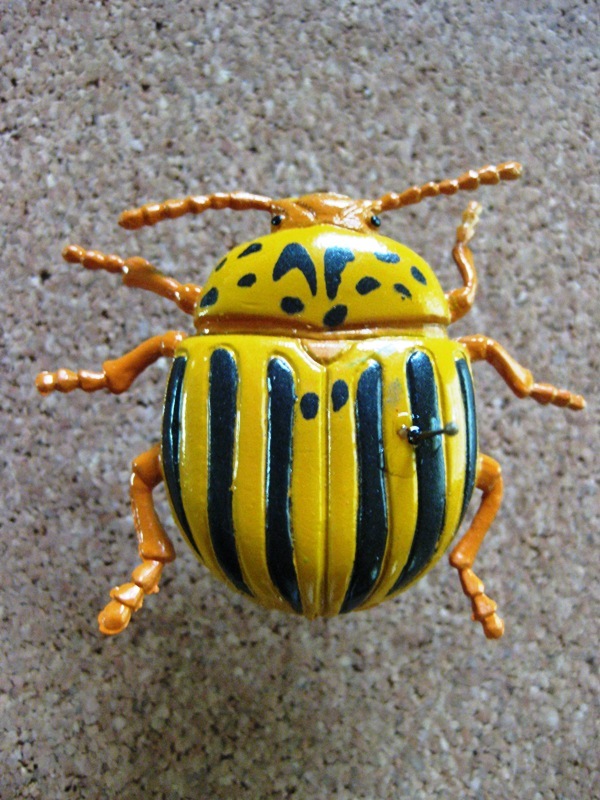 Today the lawn ornament beetle is considered rare. This insect’s population exploded in the mid- 1900’s when lawn ornaments, particularly pink flamingos were popular. 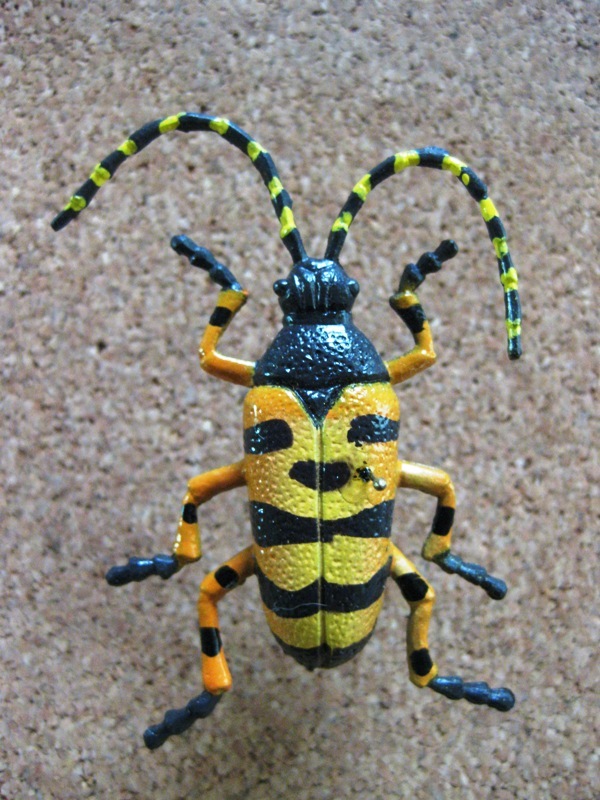 This Cerambycid was named P. phaenicopterus after the flamingo genus Phaenicopterus in recognition of its strong association with plastic pink flamingos. Beetle populations have steadily declined as the pink flamingos have decreased in popularity. There is hope this species may rebound with the increase in other plastic yard items such as lawn chairs and big wheels. A common denizen of landfills of the mid-western U.S., Z. styrofoamensis is considered a scavenger preferring party garbage, plastic and styrofoam plates and cups. The white coloration is variable. Some specimens have only a few small white patches whereas others are nearly all white. In rare instances the white exoskeleton expands so much that it takes the shape of a packing peanuts. This explains why this species was overlooked for so long. Scientists performing landfill research were unaware this species was present due to its exact mimicry of the packing material so often discarded in today’s dumps. Recent research has shown the white coloration can be directly correlated to the amount of styrofoam eaten. A common denizen of battlefields and army bases around the world. This dung beetle is known to lay its eggs inside empty bullet shells and then pack it with dung. Inside the bullet shell, larvae are protected from being crushed by the heaviest of military equipment. One is likely to find this species any place guns are fired. Adults have four extremely sensitive, orange and yellow sound sensors on the elytra. At the sound of a rifle shot, adults fly from miles away towards the sound. 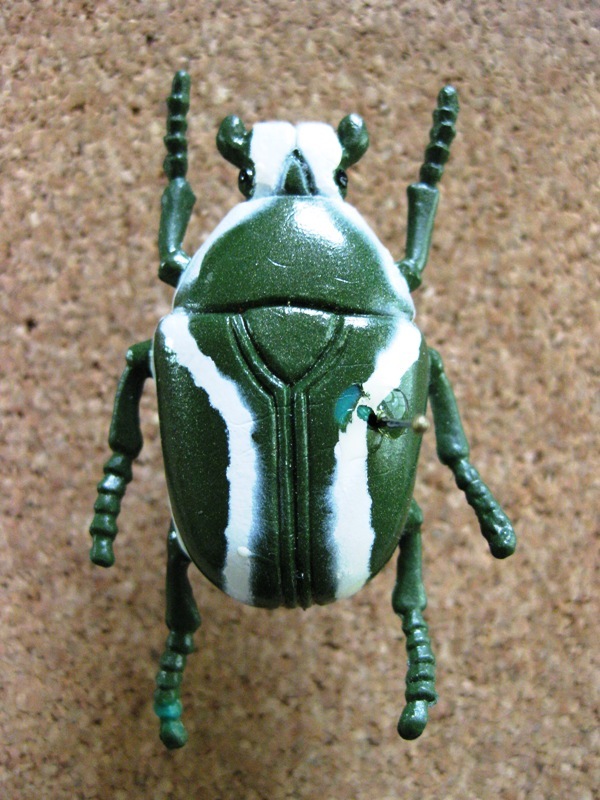 Hundreds of this beetle species can be found, after an army platoon has taken target practice for the day. The first male to arrive at a bullet shell, quickly rolls it as far away from the noise as possible. Females are attracted to males that stridulate a sound something like “Ready, Aim, Fire”. This is the first known, genetically enhanced species developed to combat one of the worlds growing refuse problems, tires. Essentially scientists were able to cross a common scarab beetle with a Mexican jumping bean. The combination produced a new species capable of consuming rubber. Scientists quickly released thousands of these beetles into the ever growing, piles of old and used tires found in today’s junkyards. The tire decomposition program was deemed a complete success. As so often happens, however, when all the tires in landfills and dumps were consumed, the beetles switched to tires still in use. There has been a rash of flat tires causing millions in damage. At its worst, the Goodyear Beetle can consume all four wheels and the spare in less than a week. This species of beetle is only attracted to flashes of colorful lights such as at fireworks displays and Pokemon reruns. In flight, the body absorbs the flashes of color and retransmits them, often in technicolor. Some of the latest fireworks displays have been enhanced by releasing thousands of this beetle prior to the show. Similar flashes have been observed if a beetle lands on a television screen during a Pokemon show. The same flashes that cause epileptic seizures in some people, cause this beetle to buzz the national anthem of Mexico. As with other insects, the species described above are easy to collect if you know how. Searching museum specimens, one quickly realizes that the only people collecting these insects were all under 12 (as was I when I collected each species). 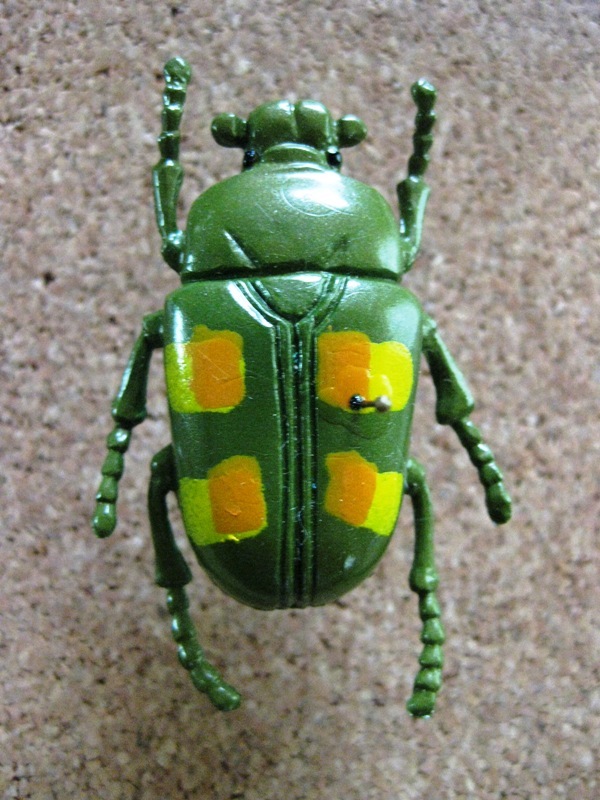 If you want to collect these beetles, the best opportunities will come if you take along a child. Children seem to be the only ones who have the imagination to find these beetles. This is an opportunity to point out that today’s children are being denied the chance to enjoy the outdoors and learn about the wonderful creatures that live there. For the most part, our education system no longer devotes the time to teach about the plants and animals that occupy our planet. Even at home, children now spend their free time playing video games and watching TV instead of being outdoors. Few kids get the chance to walk on a dirt path in the woods or hold any living creature in the palm of their hand. This is where you, the reader of this blog can make a difference. You can give our next generation the chance to enjoy the wonders from the creatures that live all around us. The next time you go out in the field to collect insects, take a kid with you. Volunteer at a local library, school or park. All these places cannot exist without volunteers and you have a lot to offer. It is amazing how much kids will learn about the world around them given the chance. The surprise in how much you learn in return from them! 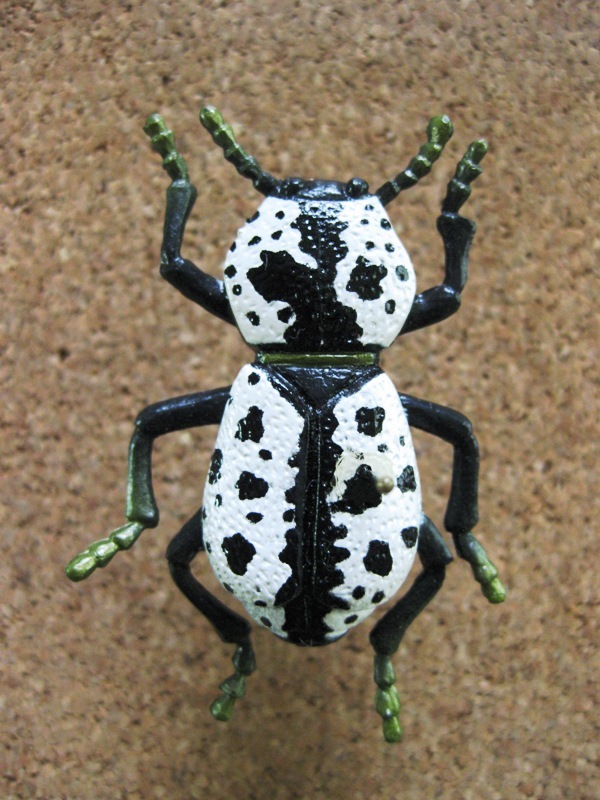 This entry was posted in [No taxon] and tagged beetles, education, guest blogger, humor, insect collection, nature. Bookmark the permalink. Nicely done, Rich, I think your last two paragraphs are really important. I came to teaching after earning a MS degree in entomology. I teach at a non-traditional high school in which I teach the standard first year biology classes as well as field biology and genetics courses. I have quite a bit of contact with university folk, but limited contact with other K-12 teachers. I recently had opportunity to take part in a four week National Writing Workshop Project workshop. The participants were a broad spectrum of K-12 teachers. I can’t tell how impressed I was with the creativity/thinking/exposure to the natural world these teachers provide their kids. Granted it was a select audience, but I came away feeling very optimistic about the future for our kids. Subbing for Ted leaves you big shoes to fill. You did well! I was out with my 14 year old daughter yesterday in the Saskatchewan River Valley here in Edmonton, attempting to photograph solitary bees that were nesting in a exposed earth bank. We were followed for a while by a group of four 10 to 12 year old boys, who riddled us with questions about what we were doing. I answered as best I could, but I noticed an underlying tone of apprehension in their questions and in their conversation. Their concerns were about bee stings, wasps, ‘poisonous snakes’ (none in this part of Alberta) and things getting in their hair. This from boys who are lucky enough to live near a great natural resource, but who seem to have no clue about what it has to offer. They soon went off to the security of their homes. I hope our talk of earth nesting bees and spider hunting wasps will have aroused some interest in nature in at least one of them. Too funny… that’s a really cute post, and a great way to share with kids. Thanks. But there is so much interest and need for information! You’re right, Rich. It’s direct experience with living things that makes an impression! Nicely done, Rich! If I can’t manage to collect these species soon, I know where to find them (you know what they say – the best collecting is in other people’s collections!). I do a lot of school presentations – mostly elementary school – and it’s a cinch to get the kids interested in the bugs. I’d like to see you in action in the schoolroom sometime.